Do you find yourself feeling overworked, exhausted, perpetually busy yet unproductive? Then this book is for you. 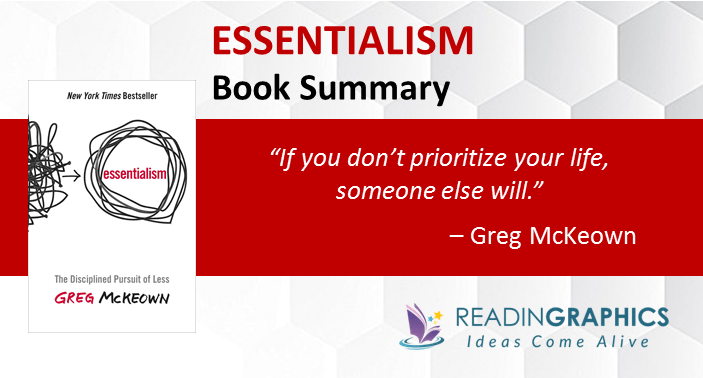 “Essentialism: The Disciplined Pursuit of Less” by Greg McKeown explains how to focus your energy only on what’s essential, so you can do the right things that truly matter. Today, we have more choices and connectivity, but we also face more distractions and and social pressure, making it harder for us to say “no” to the nonessentials. As a result, many people find themselves too stretched too thinly across too many areas. In this summary, we’ll outline the concept of essentialism and the 3-part model of becoming an essentialist. Essentialism is the discipline of continuously defining where we can create the most value, then finding ways to execute most effortlessly. Essentialism is fundamentally about designing and taking control of your life. The same amount of energy, when directed purposefully, can bring you much closer to your goal. Know the right things you must do, reject everything else and direct your time and energy to create the biggest impact where it matters. In so doing, you drastically improve both your levels of performance and results. We can’t always control the options presented to us, but we can always control the choices we make and how we spend our time and energy. Remove the words “I have to” which puts you in a reactive, helpless position. Use the words “I choose to”—remember that you can always choose how to respond to your circumstances. We’re surrounded by noise that confuses and distracts us. Stop thinking that everything is important. Learn to filter out the few vital things that are truly valuable from the mass of trivialities. Trade-offs are a fact of life. You can do anything but not everything. Stop thinking “How can I do it all?”. Instead, choose the problem you’d focus on, and ask “What trade-offs will I make?” and “How can I go really big on this?” See trade-offs not as losses but as opportunities to find the highest-impact options. The disciplined pursuit of less involves 3 key parts, with each component reinforcing the others in a cycle. Let’s take a quick look at what they entail. Do get a copy of our full 11-page summary for more details or get the full mojo from the Essentialism book. Essentialists create the time and space to explore options so they get clear on their goals and can identify the activities/efforts that’ll create the biggest contribution. But, they don’t react to most of these options unlike the nonessentialists. In the book and our full book summary we explain why it’s vital to “escape” occasionally, play and rest, and how you can explore options more effectively by looking deeply and tightening your selection criteria. After you’ve distinguished the vital few from the trivial majority, you must cut off the latter from your life. In the book / complete summary we elaborate on how to define your “essential intent”, develop the courage and skill to say “no” gracefully, uncommit from unproductive obligations, cut away the nonessentials, and set boundaries to take control of your life. Non-Essentialists spend their time/effort trying to force their way through execution, while Essentialists invest time/effort to figure out how to do things in the least effortful way. In the book / complete 11-page summary, we look at what it means to build in buffers or contingencies, systematically address constraints that hold you back, win big through small steps, use routines/habits to get in flow, and focus on what’s the most crucial right now. Fundamentally, Essentialism isn’t something that you do, but something that you become. It’s about thinking, acting and living in a way that allows you to have the greatest possible contribution and fulfilment, so you live a meaningful life without regret. 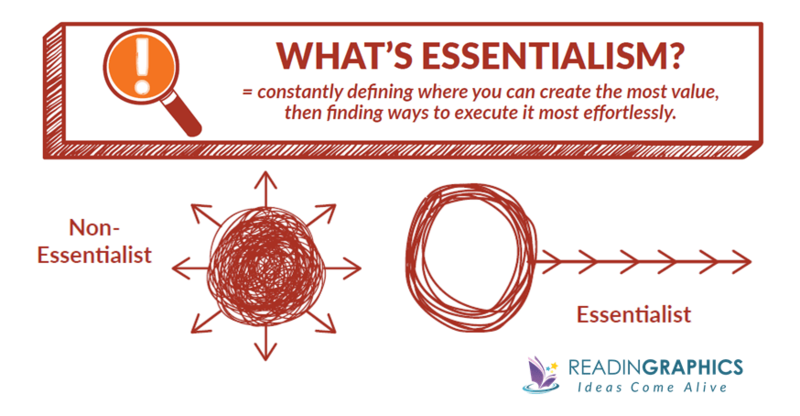 As Essentialism becomes an integral part of who you are, you’ll become more astute about what you put on your to-do list, and find it more effortless to achieve results as you remove constraints and install systems to reduce friction. And, with greater clarity, purpose and presence, you’ll find much more joy in life and living. This is an easy-to-read book with many references, anecdotes and examples to reinforce the ideas in this summary. For more details, do get a copy of the book, get our Essentialism summary bundle, or visit gregmckeown.com. 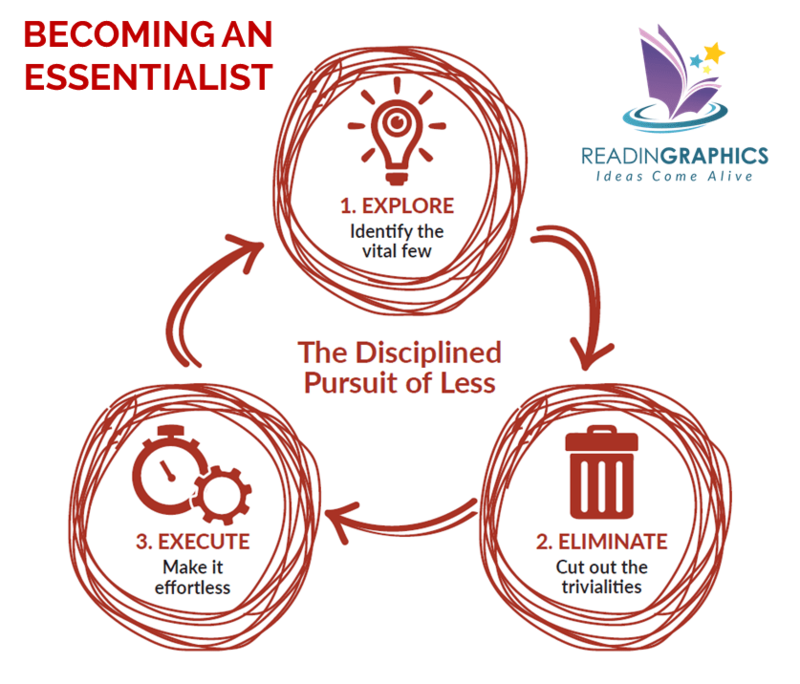 Master the disciplined pursuit of less with Essentialism! 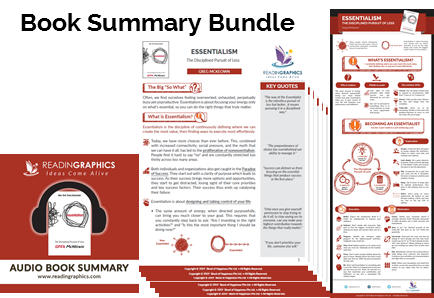 Click here to download the Essentialism summary & infographic Click here to order the book online Click here for more resources and free tips!